My post and photos are sponsored by Bob’s Red Mill. Raspberry White Chocolate Cookie Bars are a delicious way to start the holiday baking season. They’re practically foolproof, so even beginner bakers can make and share these with pride! We all know that the holidays are about giving to each other and celebrating our love for family and friends. What many don’t realize is that this time of year can be hard for people with depression and that those who are missing loved ones often feel left out of the joy. Three years ago when my husband passed away shortly before Christmas, my family learned just what a difference small acts of kindness can make to those facing difficult holidays. Our generous and thoughtful friends made sure we had gifts under the tree, treats to savor, and company when we needed the comfort. Now, as our friends did for us, we like to bake homemade treats to share with those we know are having a difficult holiday season. Just as our friends once cheered us up, we’ve seen what a difference it can make to someone just knowing that others are thinking about them. This year, we’re baking for the residents of my mother’s nursing home as well as my elderly neighbor who is facing her first Christmas without her husband of 52 years. Since baking for others means giving your best, using Bob’s Red Mill flours is the smart choice. Their high-quality flour lets your best recipes shine. That’s true whether you’re using their all-purpose flour or Bob’s Red Mill gluten-Free 1 to 1 baking flour — both work brilliantly in this Raspberry White Chocolate Cookie Bars recipe. HERE’S A GIFT FOR YOU, TOO! If you’re having a hard time getting into the holiday spirit, try baking treats for a friend. It turns out that baking or cooking for others is a form of therapy and psychologists say it promotes the baker’s well-being, too! 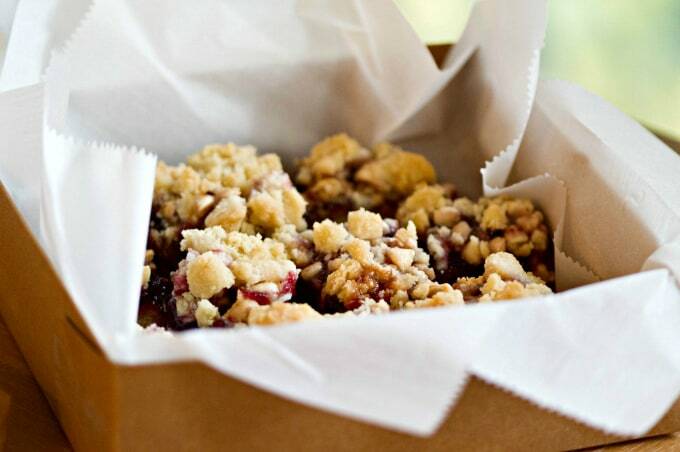 To make matters even sweeter, here’s a coupon for $1 off any Bob’s Red Mill product. Ready to get your bake on? 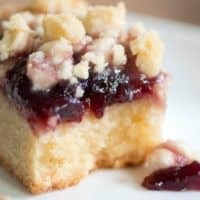 Sweet raspberry jam and white chocolate layered between a buttery cookie crust. Preheat the oven to 350°F. Get a 9x13" baking pan ready but do not grease it. In the bowl of a stand mixer, combine the sugar and butter on medium speed until well-mixed. Pause to scrape down the sides and add the salt and vanilla extract then continue mixing 1 more minute. Using low speed, at the flour 1 cup at a time and continue mixing until it looks like crumbs. Scoop one generous cup from the crumb mixture and set it aside. 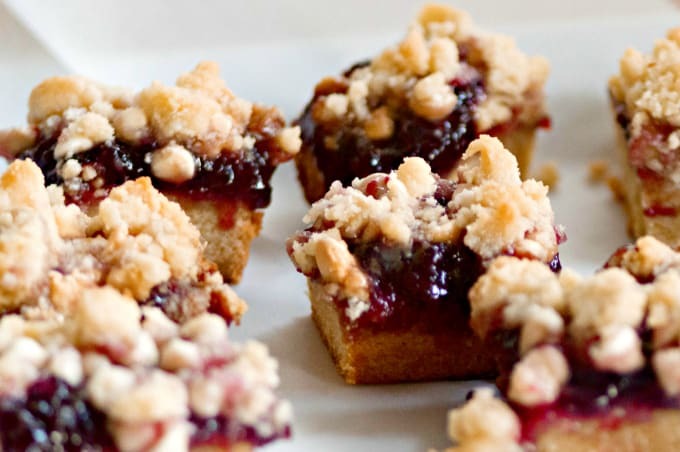 Remove the baking pan from the oven and scoop spoonfuls of the jam onto the partially-cooked cookie crust. Once the jam softens, use the back of your spoon to spread it to the edges. 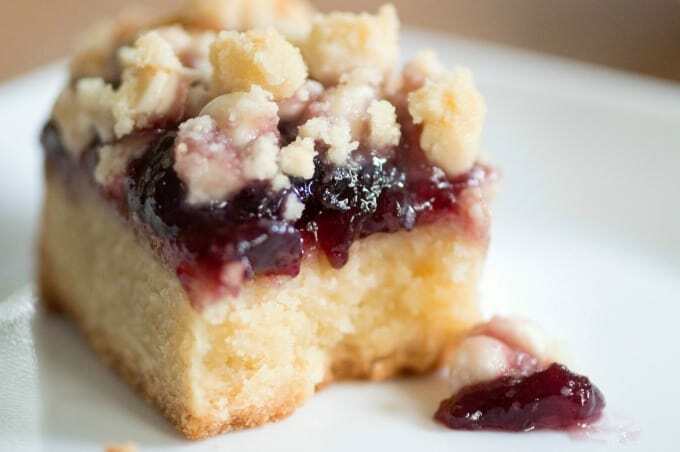 Sprinkle the white baking morsels evenly over the jam, all the way to the edges. Finally, sprinkle the 1 cup of reserved crumble mixture on top. Bake an additional 25-30 minutes at 350°F, until the topping is light golden brown. Cool completely in the pan before cutting into bars. This post was written by me and sponsored by Bob’s Red Mill. Your post is featured on Full Plate Thursday this week. Enjoy your new Red Plate and thanks so much for sharing with us. What a special post and a special treat to help so many people have a delicious holiday treat! Your Raspberry White Chocolate Cookie Bars will be delicious! Hope you have a great week and thanks so much for sharing with us at Full Plate Thursday. These bars look like they are packing a whole lot of flavor. I LOVE the reminder to do special service to those in need this time of year! Everyone can use extra kindness, and would love to receive something kind, and from the heart! 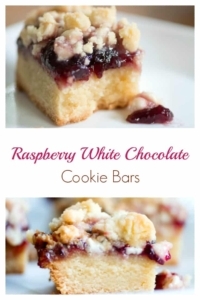 These raspberry white chocolate cookie bars look so yummy! I have pinned this recipe so I can save it for later! Wow, these look so yummy! That’s wonderful that you bake for the nursing home. What a sweet gesture. I know they love it. Pinned. Thank you for sharing on Merry Monday! Hope to see ya next week! Thank you for Pinning, Kim! These are perfect for an afternoon tea! Look absolutely delish! Thanks for sharing! I love the raspberry and white chocolate combination!